[London, England] : Guinness World Records Limited, 2018. 255 pages : color illustrations, photographs ; 31 cm. "The world&apos;s most popular record book is back with thousands of new categories and newly broken records, covering everything from outer space to sporting greats via Instagram, fidget spinners and all manner of human marvels. Inside you&apos;ll find hundreds of never-before-seen photographs and countless facts, figures, stats and trivia waiting for you on every action-packed page. Guinness World Records 2019 is the ultimate snapshot of our world today." --Publisher&apos;s description. Guinness book of world records 2019. 245 Title 00 $a Title Guinness world records 2019. 246 VaryingTitle 30 $a Title proper/short title World records 2019. 246 VaryingTitle 3 $a Title proper/short title Guinness book of world records 2019. 505 ContentsNote 0 $a Formatted contents note Universe -- Planet Earth -- Living planet -- Human beings -- Fantastic feats -- Science & technology -- Arts & media -- Sports -- Do try this at home. 520 Summary $a Summary, etc. 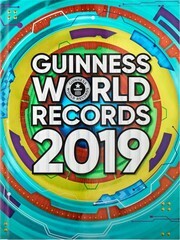 note "The world&apos;s most popular record book is back with thousands of new categories and newly broken records, covering everything from outer space to sporting greats via Instagram, fidget spinners and all manner of human marvels. Inside you&apos;ll find hundreds of never-before-seen photographs and countless facts, figures, stats and trivia waiting for you on every action-packed page. Guinness World Records 2019 is the ultimate snapshot of our world today." --Publisher&apos;s description. 655 IT:Genre 7 $a Genre/form data or focus term Trivia and miscellanea. 710 AE:CorpName 2 $a Corporate name Guinness World Records Limited.